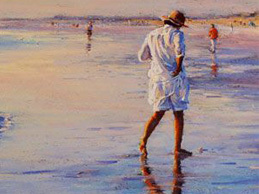 A good time was had by all on the weekend of the 18th and 19th July at the Stephen McCall mixed media/pastel workshop. On day one, using white suede paper, we were shown how to do a complimentary or contrast underpainting using watercolours or acrylics to paint a seascape. Some of this underpainting was allowed to show through on the finished art piece which really had the colours bouncing off each other and gave great depth to the painting.The use of clear pastel primer on a headland gave us texture to then go over with our pastels. On Sunday we were shown how off-cuts of matt board can be recycled as painting boards using paint with or without clear pastel primer or Art Spectrum coloured pastel primer…We then worked on our own photos with Stephen as our guide, using the skills we’d learnt the day before. Morning and afternoon tea was delicious thanks to Judy Balfour and participating members. Local Bright artist Stephen McCall will be leading an AWAS Mixed Media workshop on the weekend of 18th and 19th July 2015, to be held from 10am to 4pm at the Paintbox studio, Gateway Island, Wodonga. Do you use acrylic, inks, watercolour or pastel? This workshop will use these mediums in a mixed media format. You can use two or more mediums combined with pastels and learn some new, innovative techniques. If you don’t use pastels here is your chance to give it a go! You do not need to buy pastels as Stephen will provide a wide range of colours for you to use, but if you have your own pastels please bring them along. 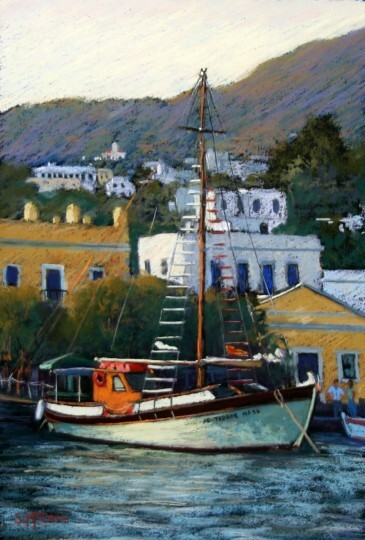 Stephen paints mainly with acrylics and pastels, but in this workshop he will be pushing the boundaries in a number of ways. We will be using texture mediums, be doing under painting with with watercolours, acrylics and / or inks and combining these with some pastel work. The amount of pastel is up to you; you may only use pastels for some final detail, (just add a few lines or add some subtle texture) or you may like to mainly use pastels over under painting. So come along and be excited by a different approach to your work and learn some new skills. Complete the workshop enrolment form click here and pay the deposit or full amount promptly to ensure your participation. Class number is limited to 12 participants so don’t delay. FILLING FAST!!!!! If you have any questions please e-mail or phone me. See contact details on enrolment form. This workshop was held on 11th and 12th October. This was Regina’s 5th pastel workshop at Albury Wodonga Artists Society. We quickly became friends, and I was impressed with her workmanship as a teacher. There was quite a lot of discussion in the room about the variety of the images even though we were almost all working the same topic. She was comfortable that we were different people, that the images we produced reflected our own personality, and showed the different techniques each of us brought to the room. Regina moved around the room spending time with each person, and redirected where necessary, and through the process of having all of us with easels against the wall was able to see around us to the image we were creating. Instruction was given first for each section then we did our version before she moved onto the next section, -sky, distant landscape, central landscape, feature and foreground. The feature was a tree in one picture, and a stream in the other. The atmosphere in the room was friendly and businesslike in a good mix. We all got opportunities to move around to see each other’s work. Regina stayed with me and we got a chance to do a photo-shoot of the river, and to see the orchid show. Dinner was at Baan Sahib Jai Thai restaurant on Saturday night and 6 of us shared a meal with Regina. It worked well too, to have Regina open our exhibition on the Friday evening. This workshop with pastel artist Regina Hona is running on 11th and 12th October 2014. The subject matter will be “Water”. (For more information, contact Lin Stark 02 6056 0938) Click here for Enrolment Form. Regina is an Australian artist who works in both pastel and oils. Read more about Regina at her web page here.